I love crockpot cooking. Allowing the meal to sit in it's own juices for hours seems to heighten the flavor of every bite. I look for chances in life to add a crockpot mentality to my tasks. Taking the crockpot approach to sermon preparation allows me to let passages soak in my mind for several weeks before I present them. This means when I stand up to preach, the wrestling is done and the passage feels like an old friend. Week One: I need to understand what the text says. I have two study sessions set aside during week one in which I devote my efforts to exegeting the text. Week Two: I need to determine how this text applies to our church community. During week two, I work through several exercises to help me look at the passage from several different angles. The fruit of week two is several short "next step" ideas. Week Three: I need to discern the most effective method for communicating the truths I've unpacked. As in week two, I've created several exercises which help me consider a variety of possibilities for my sermon presentation. The goal of week three is not to create or find new content, but to arrange the content I've already discovered. 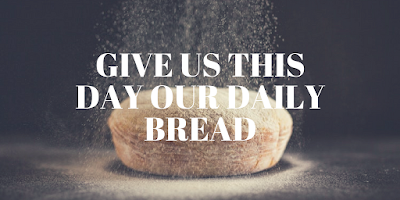 Week Four: I need to get ready to preach. Throughout this week, I have several tasks to accomplish so that Sunday's sermon will be clear and concise. I also use week four to create a variety of follow-up materials for those who desire to go further with the sermon. 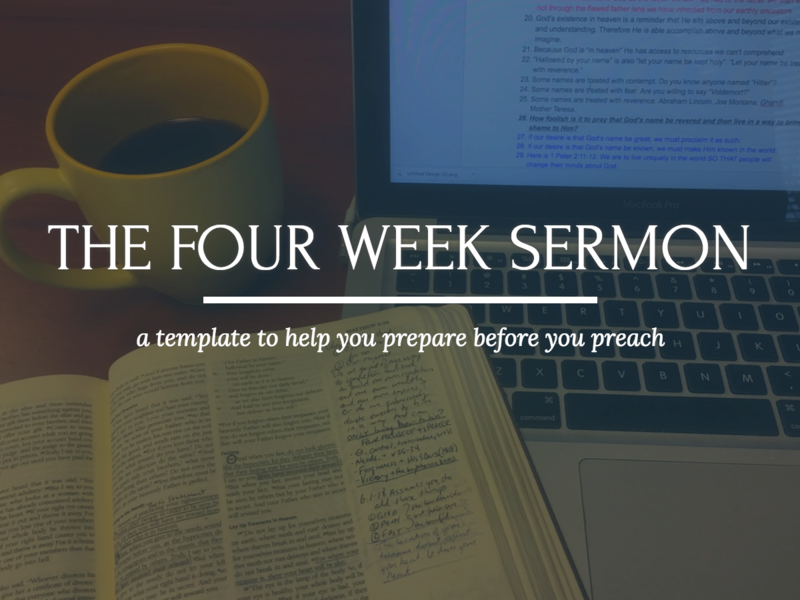 Different sermons lend themselves to different processes, so I may deviate from this template from time to time, but it is my starting point for every sermon. 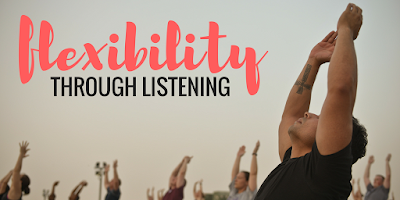 I'll post later about some of the exercises I use each week, but you can see them all listed at the template link above. If you have questions or would like to chat more about this template, feel free to leave a comment or shoot me an email. WHY DON’T THEY SOLVE IT? Most problems require more than one solution because it is the complexity of the situation that has made a problem. Most problems have a presenting and immediate symptom, a long-term pattern which is unhealthy and a mess that needs to be cleaned up. 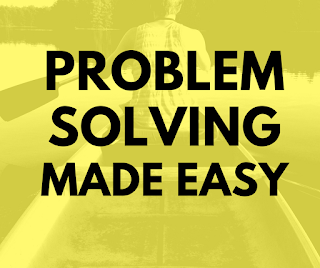 Over the next few paragraphs I’m going to tease out the three steps needed to solve most problem and then I’ll demonstrate how these three steps should be used to solve some of our countries most “unsolvable” problems. Finally, I’ll share some thoughts on why our elected officials often seem unwilling to address these difficult issues. This is a long post, but I think it will give you some mental beef jerky on which to chew if you make it to the end. STEP ONE: SOLVE THE URGENT AND IMMEDIATE PROBLEM. Imagine your boat is sinking. While you may decide it’s time for a new boat and you may realize a need for boating lessons so you can stop running into rocks, neither of these problems are urgent and immediate. In the moment, you need to start bailing water and patch the whole causing you to sink. The reason most problems never get solved is because people are too concerned with long-term fixes or too worried about past causes and they never deal with the present emergency. Before anything else, solve the urgent and immediate problem. STEP TWO: FIX THE LONG TERM PATTERNS CAUSING THE PROBLEM. Once you’ve gotten your boat safely to shore, it’s time to start thinking about why your boat sank? Have you been lax in your care and inspection? Have you run aground too many times? 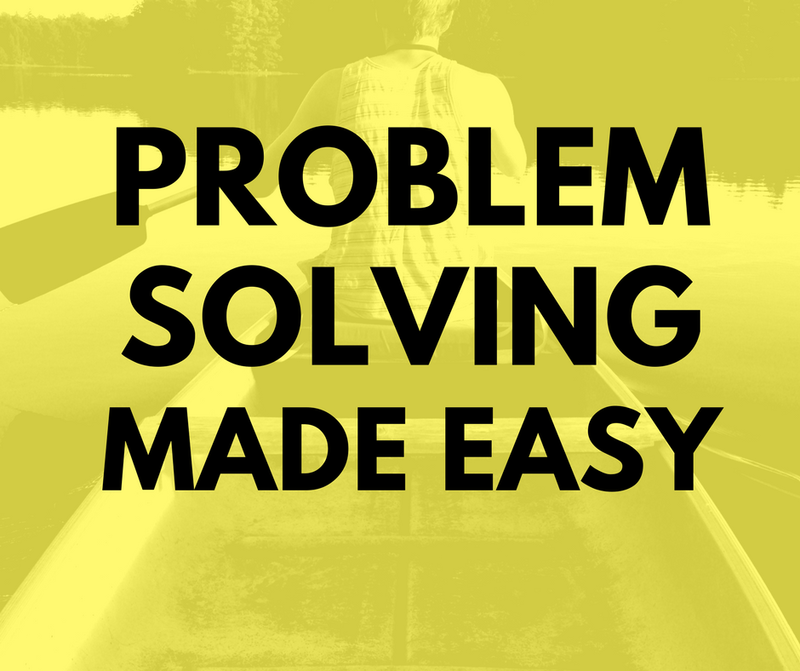 Although you’ve solved the initial problem, you must know address the negative patterns in your boating life or else the original problem will return. Too often we find ourselves in a cyclical pattern of defeat because we solve the problem in front of us but never address the habits and patterns which caused that problem. STEP THREE: CLEAN UP THE MESS. Having fixed your boating issues, you need to inspect your boat to make sure there is no long-term damage from your near-sink experience. When we make a mess of things, a little time spent cleaning up can go a long way to a much smoother future. Allow me to briefly suggest one example of the three step problem-solving method which could help us address our countries immigration struggles. SOLVE THE URGENT AND IMMEDIATE PROBLEM. Simply put, we need to ensure that the people who are entering our country are the people who should be entering our country AND the people who shouldn’t be entering our country are not entering our country. A wall might be one solution to this problem (it is likely more symbolic of a new commitment to security than it is a foolproof solution). The point is that before any discussion about deportations or future policy happens, the first problem needs to be solved which is to open the doors to the right people and close the doors to the wrong people. FIX THE LONG TERM PATTERNS CAUSING THE PROBLEM. Here is where policy debates should happen. We should have wide discussions about what immigration should look like in the future and we should have reasoned debates about how immigration should be carried out. However, these conversations should be saved until after the urgent and immediate problem is solved. Once policy is clear and the future has been decided, we can begin talking about how to deal with those who are already here illegally. Having this conversation before the first two steps only ensures we’ll be addressing the same issues again in 10–20 years. SOLVING THE SCHOOL SHOOTING PROBLEM. I vividly remember Columbine. Marianne and I were getting ready for a sports banquet for her cheerleaders as we watched that horrific event unfold on television. It’s hard to believe that was almost 30 years ago and we haven’t figured out how to stop these shootings. Here’s my suggestion. Simply put, we need to keep evil people from entering schools with guns. Before we talk about anything else, our first conversation should be about how to secure our schools so those who wish to do ill cannot even get in. This might mean walls or fences, it might mean modifying entrances and exits and it might mean more armed security guards. Right now, the only problem we should be trying to solve is how to protect our students. Once we’ve secured the schools, we should address the systemic issues involved. We can then discuss background checks, improving mental health care, gun purchasing policies and any other contributing issues. We must realize, though, that these are all long term solutions and will not protect students today or tomorrow. I might also suggest looking at more severe punishments for those who commit crimes with guns. I’m not sure what the extent of the mess is in this situation. Certainly we need to deal with the huge amount of illegal firearms in our country. Once we’ve solved the initial problems, we can figure it out. WHY IT ISN’T GETTING SOLVED. Columbine happened in 1999. Bill Clinton was the sitting president. SInce then, George W. Bush and Barack Obama have served 8 year terms. Donald Trump has been president for a little over a year. None of them solved this problem. There have been 9 midterm elections in which an entire new House of Representatives has been voted in, none of them have solved this problem. Every seat in the Senate (100) has turned over at least once, half of them twice since then. None of them have solved this problem. Our leaders don’t solve these problems for two reasons (there are more, but this is getting long). THE MYTH OF COMPREHENSIVE REFORM. Comprehensive reform never happens because it is impossible. The three-step solution I’ve outlined here is not rocket-science, but it requires difficult decisions that won’t make everyone happy. Your elected officials would rather twiddle their thumbs and work on comprehensive reform than make unpopular decisions that actually lead to solutions. Our nation is a melting pot. That means lots of people have lots of ideas and not all of them are the same. The constitution was written because those men were willing to compromise. They all realized that they’d all have to give some things up so that they could all have something good. We all make these kinds of decisions every day. I don’t spend money on a new book, because I’m saving it for vacation. I’d like to have the book, but I want vacation more. Sometimes I go shopping with my wife, not because I like shopping but because I love my wife. I am happy to give up my preference to avoid Ulta if it means the benefit of being with her. Our leaders don’t compromise… ever. If they would be willing to get together, find the solutions on which they all agree and then decide on solutions with which they may not agree but might work, we could solve these problems and more in an unbelievably short amount of time. Yup. Start modeling in your own conversations, the behaviour you want from Washington. Instead of arguing to convince others to think just like you, listen to others to determine how you can find common ground. Instead of posting memes on social media (these do nothing to promote solutions and everything to promote division), ask questions and suggest solutions. Instead of voting for those who will “hold the line” at all costs, vote for those who are willing to give up a little to get a lot more. That’s all I have to say about that… and it was probably too much. "In The Dust of Death Os Guiness makes this point by describing a comedy skit performed by the German comedian Karl Vallentin. In this routine the comic comes onto a stage illuminated only by one small circle of light. He paces around and around this circle with a worried face. He is searching for something. After a while a policeman joins him and asks what he has lost. 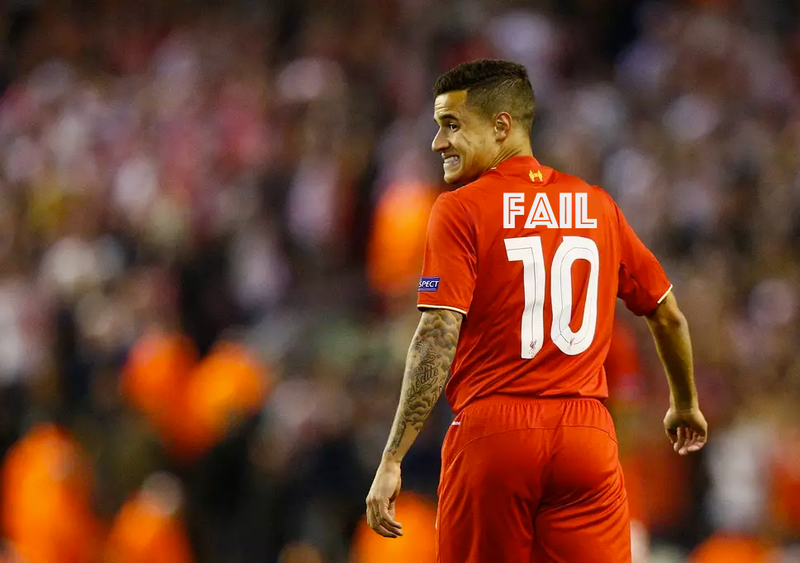 'I've lost the keys to my house,' Vallentin answers. The policeman joins the hunt, but the search eventually appears useless. 'Are you sure you lost it here?' asks the policeman. 'There's no light over there,' answers the comic. If there is no God or if there is a God but the failure to know him is God's fault, then the search for knowledge is like the search of the German comedian. Where the search should be made, there is no light; and where there is light there is no point in searching. But is this the case? The Bible declares that the problem is not God's but ours... God can take, and actually has taken, steps to reveal himself to us, thereby providing us with the missing key to knowledge." I found this list which I created 10 years ago today. I still agree. These are all bad ideas. 1) Fill your team with people just like you. 2) Ask someone to do a specific job, and then do it yourself. 4) Look out for #1. 6) Make sure all ideas originate with you (or at least that people think they do). 7) Foster an atmosphere of paranoia. 8) Make sure nobody appears smarter than you. 9) Have a closed-door policy. The central character of the Bible is God. Often when reading the Bible we are wondering what it has to say about us, about our lives, about what we need to do, about what is in store for us, yada, yada, yada... That's not what it's about. It's about God. The middle is about him too. The entire Bible is all about God. Why make such a big deal about this? Because understanding Genesis 1 is impossible without a proper understanding of the Bible's main point. Genesis was not written to teach us about the scientific origin of the universe (that is not to say it is not completely accurate and trustworthy in any "scientific" assertions it makes). Genesis was written to teach us about God. Thus, when I read Genesis 1, the primary reason I must read it is to learn about God. If I learn something about origins... bonus! 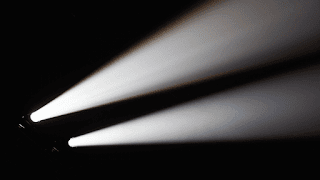 Here's a simple question, "Was there light before God spoke it?" and one perhaps a little less obvious, "Was there a heavens and earth before God created it?" and one a little tougher, "Was there anything before God created?" The answers would be: "no", "no", "there was God". For by Him all things were created: things in heaven and on earth, visible and invisible, whether thrones or powers or rulers or authorities; all things were created by him and for him. He is before all things, and in Him all things hold together. Dependency is not a virtue in our culture. Adult diapers are named "depends". We provide a tax break for those who are "burdened" by dependents. We consider adults to be those who are dependent on no one but themselves... isn't that the "American Dream"? They exchanged the truth of God for a lie, and worshiped and served created things rather than the Creator-- who is forever praised. And now the big question for us. Are we willing to be dependent? 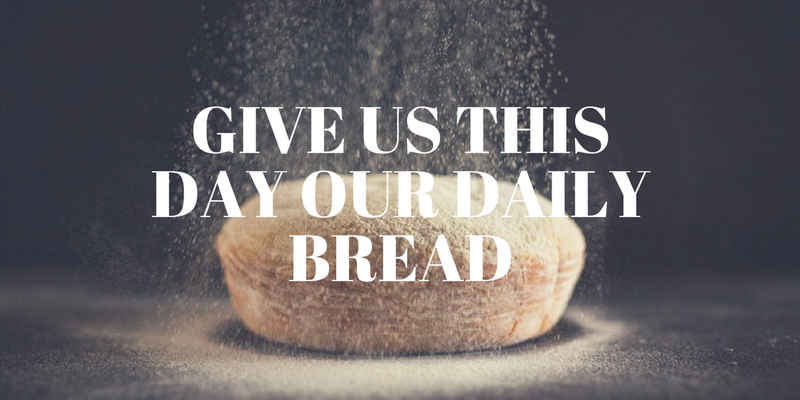 When Jesus prayed, "Give us this day our daily bread", He was really saying, "I am relying on you to keep me alive." We have no idea what this prayer really means. Our affluence and resources have made it possible for us to be completely self-reliant in the material realm. As a result, we have become somewhat self-reliant in the spiritual realm as well. Rather than our sustainer and provider, God has become our vending machine. We turn to Him when we want something; but when we really need something, we tend to try to take care of that ourselves. Like the rich fool in Luke 12, we stock-pile retirement funds, investments, and CASH and like the rich fool we say, "I have plenty of good things laid up for many years. "(by the way, check out the question Jesus was asked which prompted him to tell that story...) All the while, I give God a passing consideration once, twice, or maybe three times a week... This is hardly a dependent relationship. It comes to this. I think the reason we don't really know God and struggle to really "abide in Christ" is because we are not ready to be completely dependent on Him. It's a frightening proposition to give away the responsibility for my life. But ultimately, if God is the creator, and if I am the creation I am dependent on Him.... I just need to acknowledge it. Why Is Christianity Different Than Every Other Religion In The World? But as it is, he has appeared once for all at the end of the ages to put away sin by the sacrifice of himself. Three words in the middle of that verse define the distinction between Christianity and every other religion in the world. Virtually every world religion shares one fundamental similarity. At the heart of the religion is instruction for achieving “eternal life”, or whatever else might be the ultimate goal of the religion (eg. Nirvana, Heaven, etc.). These instructions always tell you what you need to DO. I think this concept of religion resonates with most people. Let me provide a few examples. According to the Buddha, apart from doing these things, one cannot hope to rid himself or herself of attachment or suffering, and has no hope of reaching nirvana. Islam is a religion which many consider in the same family as Christianity. Muslims find their roots in Abraham’s family tree (albeit their branch is Ishmael, not Jacob). Muslims are monotheistic, a trait they share with Judaism and Christianity (and maybe some “Christian-like” cult groups). As with the Buddhist, performing these duties is essential for the Muslim if he hopes for a “good ending” in the after-life. Most people assume (understandably so, due to the obvious emphasis of nearly every world religion) that our destiny in the afterlife is directly tied to what we DO in this life. Many people even assume that this is the perspective of Christianity, that our adherence to the rules in the Bible affects our ability to make it into heaven. This is the misunderstanding which Hebrews 9:26 corrects. First, let me point out what some might view as the ethical foundation of Christianity. Many people would view the eight-fold path and the five pillars as parallel lists to the ten commandments of Judaism and Christianity, or the three commandments of Jesus in the new testament (Love God, Love your neighbor, Love one another). However, the Bible is CRYSTAL CLEAR that someone who adheres to the ten commandments and/or the three commandments all their life will NOT earn their way into heaven. The message of Christianity is that no to-do list of good deeds will ever be sufficient to eradicate the sin that separates us from God (if this post wasn’t getting too long already, I’d discuss how our first three years of life and college put us so far behind on the good deed-bad deed ledger that we can never hope to catch up). If you’ll notice in this verse, Jesus does ALL the work. Nothing is left to us. While other Bible verses explicitly discuss our weaknesses, this verse clearly implies our inability to be right with God on our own. Instead, we rely on the fact that Jesus has already accomplished the necessary work to make us right with God. We only need to rely on His work on our behalf. His sacrifice was ONCE. It requires no on-going work on our part, it requires no repetition, it requires nothing in the future. It was a one-time historical event that eradicated the penalty of sin for all who believe. His sacrifice was for ALL. We can understand this to mean that his sacrifice was good for all people of all races, tribes, creeds, etc. We can also understand this to mean that his sacrifice was good for all time, it left nothing undone that needed to be done. According to the Bible (Hebrews 9:26 particularly), my eternal destiny is completely dependent on ONE past historical event. My ability or inability to follow a list of rules or an ethical code has no impact on my standing with God. phew! Religions require an ongoing process of deeds as the only way to be purified from wrongdoing. 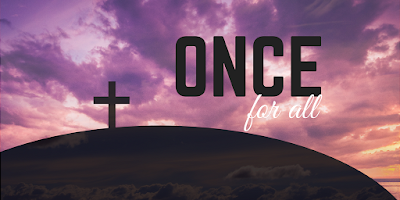 Christianity recognizes one righteous act by God was sufficient to put away sin. How do you respond to this truth? Moses summonded 10 plagues, parted the Red Sea, brought water from the rock and more using only a stick. Ehud freed his people from the monstrous Eglon, but only because he was left-handed. David brought down the giant using only a sling-shot and a smooth stone. Jesus fed 5000 people or more with only a few fish and some bread. When God is working through you, you can accomplish greatness using only what is in your hand. Everything you have has been given to you by God and everything He gave you has a purpose. He has uniquely gifted you to carry out an important role in His kingdom. As you walk through your life's journey, think about the gifts God has already put into your backpack. He has perfectly prepard you for the road He designed you to follow. Everyone has different abilities. Some are athletic, some are strong, some are intelligent, some have common sense. You may be able to create art and your neighbor might be able to fix anything. Your best friend might have an incredible singing voice and your child may constantly amaze you with their technical skills. God has given you abilities that are unique to you. Those abilities will be needed as you travel His intended path. We all get excited for different reasons because we all have different passions. You may have a passion for rescuing struggling teenagers. Someone else has a passion for feeding the homeless. Others may have a passion for enforcing justice. People's passions range far and wide, and those passions were given to us by our creator God. Proper use of our passion leads us into the life we were created to live. Whether you are an introvert or an extravert, organized or chaotic, adventurous or cautious; you have a personality that was given to you by God. No two people are alike because all of us have different personalities. While we must always be sanding off the harsh edges of our personalities so that we can be more like Christ, we must also recognize that the personality He gave us is perfect for the job He has planned for us. Whether God has given you a little or a lot, He expects you to use it as He would. The parable of the talents (Matthew 25) makes clear that our Master's expectation is that we properly invest our possessions (not just physical stuff but also our time, money and energy) into His Kingdom's agenda. The steward who properly invests his master's possesssions hears the words, "Well done, good and faithful servant." The joyous memories you have are a gift from God. The painful moments you've experienced are also part of His plan. Nothing has every happened to you that was outside of God's control or is beyond His ability to redeem. The darkest day in human history was the day Jesus was killed. Nothing so bad has ever happened to a person so good. Yet God redeemed that wickedly evil event. It was in the death of Christ, that we gained the hope of resurrection. That hope means that our past is not the end of the story. Even in the dark times, God was protecting us, providing for us and preparing us for the bright future He has planned. Look into your own backpack. What is your power? What are you passionate about? What personality traits do you have? What possessions has God entrusted to you? Where have you been in the past? Now look around you. Everywhere you look are people with needs. Our world is full of problems needing to be solved. God has prepared you to meet these needs and solve these problems. 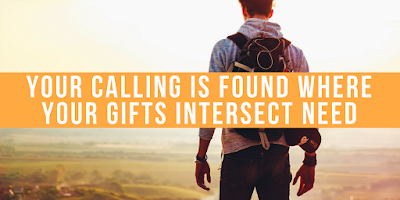 Your calling can be discovered where your gifts intersect need. What is in your hand now? What can God do with it if you let Him?